Despite three days of weakness stocks are still overbought. I thought we were going to have some real profit taking when the Dow dipped at or below 25,000 for two consecutive days but each day it rebounded to close over that level. The Nasdaq was down -2.5% from Tuesday's close when it hit the intraday lows on Friday. That is a decent decline for three days but there was no panic. Even with the bad news the market got on the China trade meeting there was no panic. The S&P dipped under prior resistance at 2,700 for two consecutive days but buy programs at the close rescued the index from a sub 2,700 close. 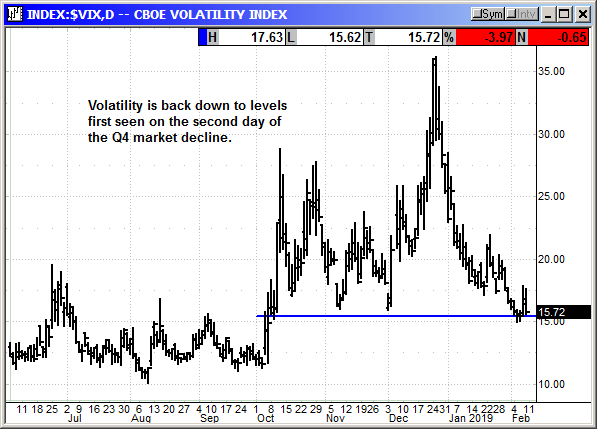 Volatility has declined to levels we saw on October 4th and the start of the Q4 correction. Traders are afraid of nothing and the markets are climbing the wall of worry. The minor decline last week came on low volume with three days with volume in the 6.8 billion range. That is the lowest volume since mid-January when the market was in a strong uptrend. Evidence of the overbought conditions come from the percentage of S&P stocks over their 50-day average. 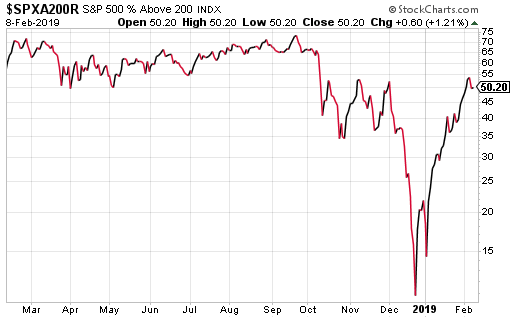 Earlier in the week more than 86% of stocks were over their 50-day. On the Nasdaq is was 75%. This is evidence of "short-term" overbought. Stocks fell hard in Q4 and have rebounded hard in Q1. 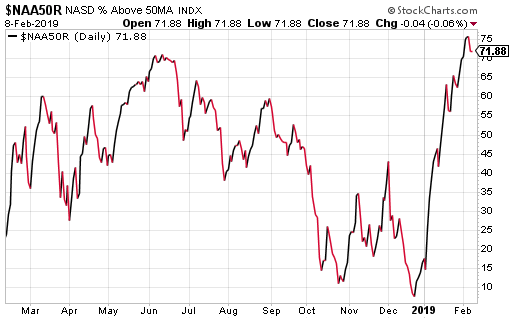 You would expect stocks to cross back over the 50-day when they rebound but 86%? On the longer term 200-day average only 54% of S&P stocks have rebounded above it and 37% of Nasdaq stocks. That means long term most stocks are still a bargain. It is just hard to buy something when the stock chart has been straight up for 5 weeks even if it is still a long way from its high. 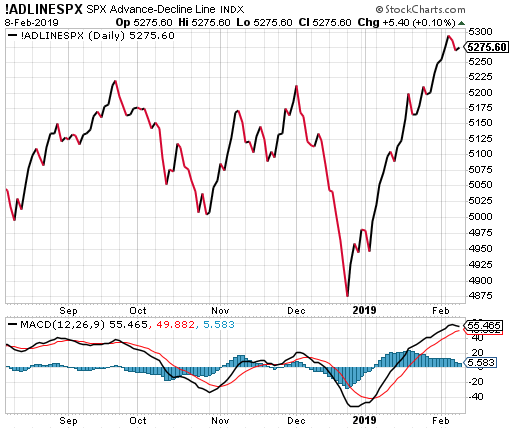 Further evidence of overbought comes from the new high on the S&P A/D line. Since Christmas stocks have gone vertical at least in the big caps. We still need a decent bout of profit taking to kill some of the momentum and make it safer to add positions. The Nasdaq got a lot of help from the chip sector. 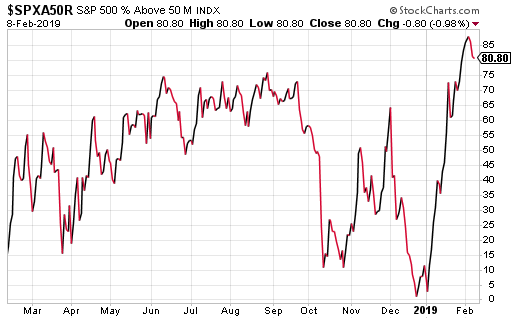 The $SOX has surged over the last two weeks despite the decline the last two days. 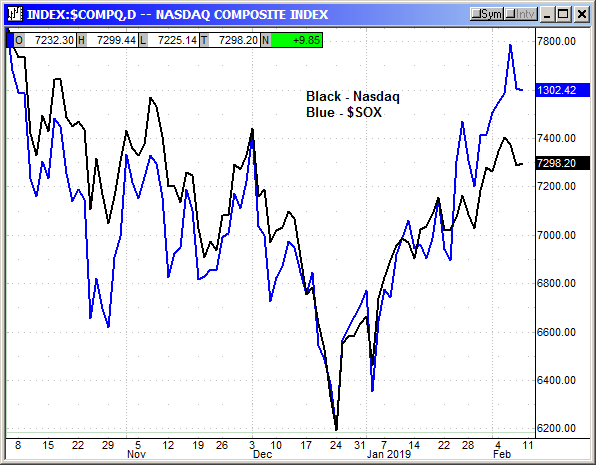 It is well above the Nasdaq on the correlation chart and suggests tech stocks could move higher. 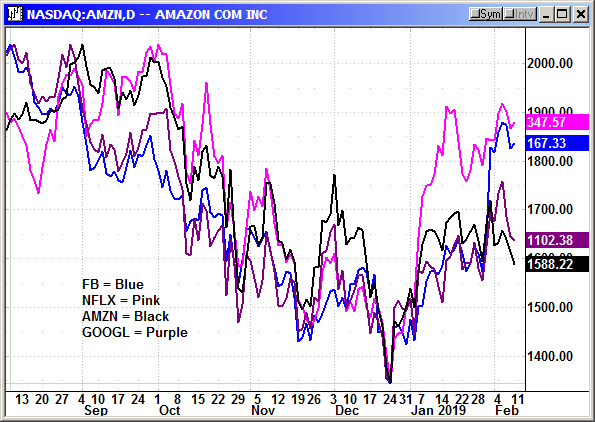 The FANG chart is a confusing picture with Facebook and Netflix jumping out of the crowd while Google and Amazon are declining. When these stocks move in opposite directions the Nasdaq has trouble posting gains. 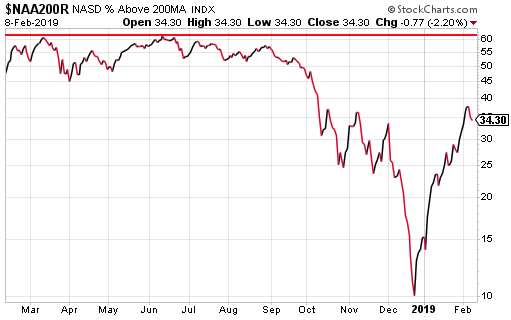 The S&P came to a dead stop at the 200-day average. As you can see back in the spring this average played critical support. However, it was not relative in Q4 when the market was so volatile. 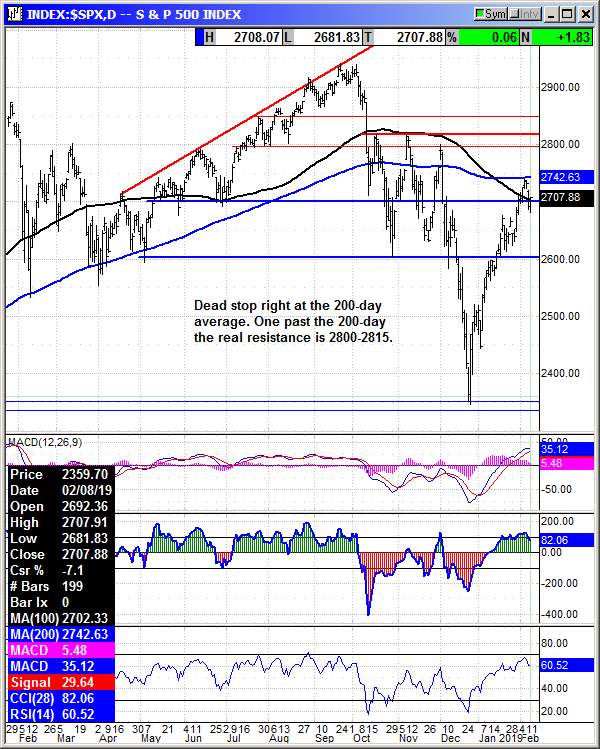 If the index can get past the 200-day the next major resistance is the 2800-2815 level. The weakness over the last several days has not yet turned into a sell signal on the MACD. The decline was too small. 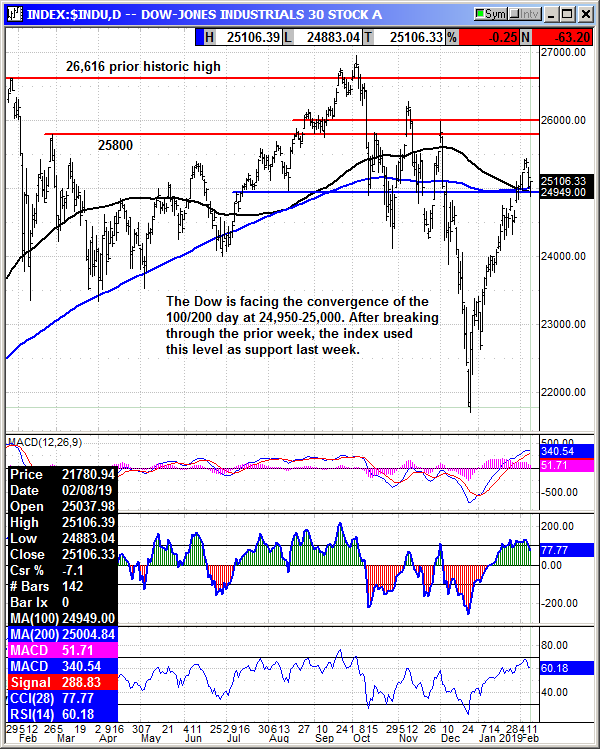 The Dow managed to push through moving average resistance and then used it as support when the selling appeared. The short-term overbought conditions were eased somewhat last week, and traders could profit from buying the dips in some of the momentum stocks. However, February is a weak month and most of the weakness comes from post earnings depression in the second half of the month. February options expiration has been a turning point in the past. Be cautious on adding long positions.